In recent years individuals, groups of people, and organisations have become more reliant upon visual images and practices of visualisation as means of understanding and communicating about the world. The wide use of camera phones in combination with the on-going rise of social media platforms, catering to easy image sharing, has resulted in everyday image production and sharing on an unprecedented scale. Most recently, Mary Meeker’s 2016 Internet Trends report highlights that younger users increasingly prefer to communicate via images, and more broadly, that daily photo sharing across Snapchat, Facebook (including Messenger), Instagram and WhatsApp now exceed 3 billion shares every day (which is up from 1.8 billion in 2014, a figure frequently cited). These activities are increasingly attracting academic interest. Businesses and government bodies now treat images shared on the Internet as a valuable form of data that can be used to inform commercial decision-making and help develop policy. In addition to this, verbal and numeric forms of data are increasingly presented through data visualisations that are intended to provide synoptic views of the available information. These developments have attracted important, timely and wide-ranging critique, including from academia. They also point to the contemporary existence of what W.J.T. Mitchell has recently called ‘Iconomania’, a term that refers to an intense desire to see and understand the world through images and visual displays. This notion is useful and widely applicable whether one considers governmental, military, and corporate surveillance, or forms of citizen witnessing, journalism as well as counter-surveillance utilising digital cameras to document the actions of the powerful. In response to these complex developments, this one-day conference seeks to create dialogue between different areas of research and practice relevant to the use of images on social media and to the wider visual web. To do this, the conference brings together prominent academic researchers from Visual Culture, Internet Studies, and Media Studies with industry-based researchers and practitioners from the areas of Social Data, Data Visualisation, Journalism and Data Analytics to explore crucial issues relevant to contemporary digital visual cultures. The conference seeks to demonstrate the breadth and richness of research and practice in these areas as well as to raise pressing questions that relate to how images and visualisations are used within different aspects of contemporary social, cultural, economic, and political life. This will be done with a concern to see how approaches from different sectors of research and practice might potentially productively inform each other. 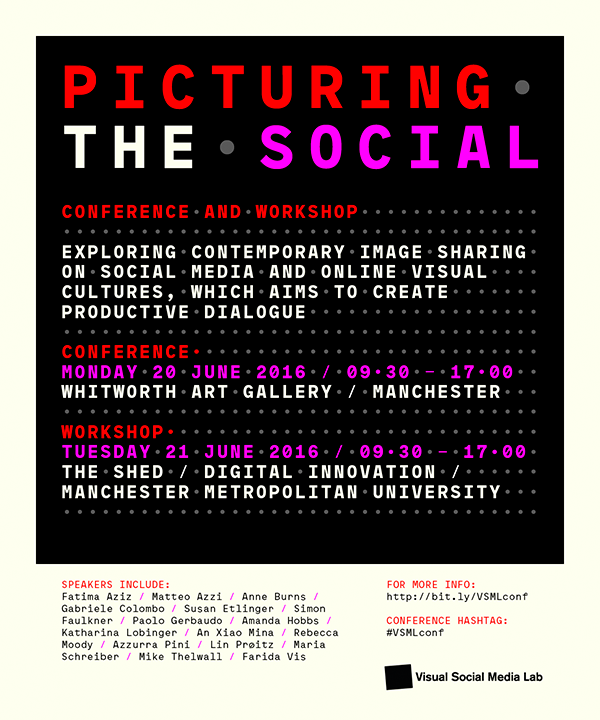 The conference has been organised by the Visual Social Media Lab (based at The University of Sheffield). The VSML develops new interdisciplinary methods and analytical approaches for the study of online visual culture by bringing together expertise from a range of academic disciplines as well as industry. This VSML team involves academics and industry researchers from The University of Sheffield, Manchester School of Art (MMU), University of Wolverhampton, Royal Holloway, University of London, and Pulsar.